With chic diners, cafés and bistros springing up to satisfy the growing appetite of epicurean tourists, Porto’s bustling city centre is experiencing a design renaissance. 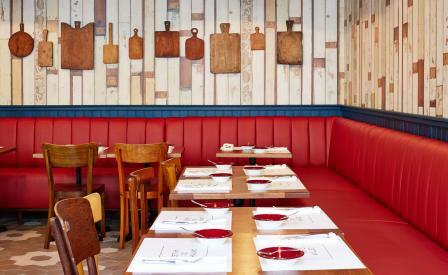 Leading the way is a restaurant from Portuguese chef José Avillez, which is inspired by one of his five his Lisbon-based outposts by the same name. The space, designed by duo Ana Anahory and Felipa Almeida, is outfitted with a mix of their own furniture, accompanied by a series of vintage Bistrot and Thonnet chairs. An eclectic display of retro kitchenware from old coffee grinders to antique cooking trays adorns the walls, while simple details such as the Piet Hein Eek wallpaper add contrast. Food is mostly local, but influenced by Avillez’s travels to include partridge profiteroles with bacon or marinated scallops with avocado. Don’t miss the fresh tuna with pickled ginger and lime mayonnaise.